Many people are rightfully concerned about their personal exposure to environmental contaminants. At every BCA presentation on breast cancer and the environment, folks ask us what they can do to reduce incidences of exposures in their daily lives. Though we do our best to answer these questions, we also know that individual actions, no matter how well intended, will not be enough to clean up the toxic mess that we as a society have made. So, in addition to urging people to protect themselves and their families from environmental toxins, we also encourage people to think about how they can get involved in doing things that will help make personal protections unnecessary. 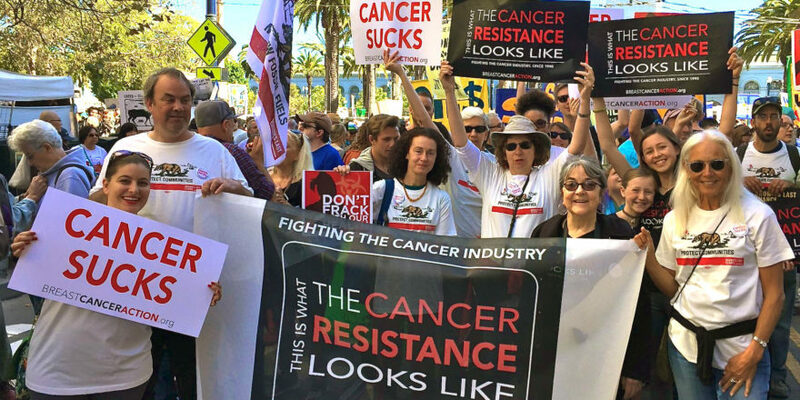 The best example of why this matters is one I heard some years ago from Sandra Steingraber, biologist, poet, and environmental health activist, when she and I presented together at a conference. Some people in the audience asked whether Sandra would advise using a filter on showerheads to reduce exposure to the chlorine in water. Sandra noted that people are exposed to more chlorine through their skin when they shower than when they drink tap water, so filtering chlorine out of shower and bath water is a good idea on an individual basis. But she also noted that, when the filters outlive their usefulness, they have to be disposed of in landfills. Eventually, the chlorine from the filters will end up back in the environment. Wouldn’t it be more effective to organize the community to demand a water filtration system that is not based on chlorine? Individual solutions aren’t bad, but they rarely lead to the kind of fundamental social changes that are necessary to build a sustainable, relatively toxic-free environment for everyone. Individuals still need to protect their health, but there is rarely a situation in which the only options available are those that stop at the threshold of their homes. For example, if you’ve decided that you shouldn’t use pesticides in or around your home, you can also help educate others about the importance of the choice you are making. If you’ve chosen to use only body care products that do not have parabens or phthalates in them, you can get involved in the Campaign for Safe Cosmetics to encourage cosmetics companies to make safer products for everyone. If you’ve decided to use public transit when possible, you can also push car manufacturers to make vehicles that don’t depend on fossil fuels, which create exhaust that causes breast cancer and other illnesses.